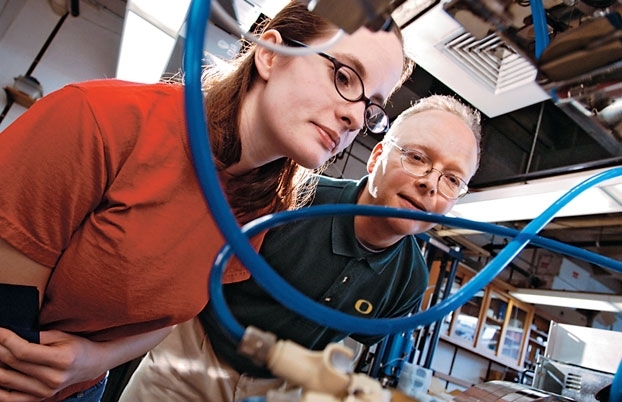 The University of Oregon Graduate School has announced its annual “Innovations in Graduate Education” seed funding program for 2014. Proposals, which are due Feb. 21, are encouraged from all faculty and staff members with interest in engaging in professional development for graduate students. As many as five awards of up to $4,000 each will be granted in support of innovative activities that focus on particular aspects of graduate student professional development. Research project management, ethics and the responsible conduct of research, mentoring and communication skills, teaching competence and active career planning are among the many suggested professional development areas. In prior years, funding has been awarded to initiatives that enriched interdisciplinary learning in graduate education. The Innovations program has aided the development of a graduate concentration in arts and healthcare management, a graduate certificate program in new media and culture, and an interdisciplinary graduate training program in environmental studies. The program also supports the development of a number of graduate specializations such as food studies and neuroscience. The 2012-2013 cycle focused on a similar objective – preparing students for careers in and beyond the academy. The program supported a plan proposed by Lara Bovilsky from the English department and Priscilla Ovalle from Cinema Studies, that addressed training to study and teach race and ethnicity across many educational disciplines through roundtable discussion and workshops. Rennee Irvin, associate professor of PPPM, also received funding for a program that introduced doctoral students to nonprofit sector executive leadership. More information about the application process is available at the Graduate School website. For further questions about the program, contact Andy Berglund, Interim Associate Dean of the Graduate School, at aberglun@uoregon.edu.